First a very Happy New Year to you. Great to be back to blogging! May all your breams and aspirations come to pass this year in Jesus name. Amen! The Industrial Court played the villain in granting the Federal Government anf injuction preventing the labout unions from embarking on a strike. Through the registrar of the court, seeing that the injunction was not obeyedThe Industrial Court Furiously tried to defend the “undefendable” saying the injunction was to prevent development of “anarchy” and didn’t stop civil society from protesting. Misread the mood of the people and “bombed” them with a New Year gift of fuel price increases believing protests will be a whimper. Appeared not in charge of the situation but rather a “puppet” of a cabal of ministers and others interests. In his second press conference announcing the N97 price, he kept using the phrase “government” has this or that. Makes one wonder who made the decision? Who is government? Is he not the Leader of the nation? Has fully squandered all the goodwill and benefit-of doubt he had with many neutral people. Gave up just when government was appearing desperate and cornered (deploying troops showed such fear). Appear like turncoats and traitors with the appearance of some unflattering pictures with the finance minister online. Senate President, Speaker of House of Reps became negotiators on behalf of the FG. Succeeded in mobilizing even before Labour began their strike action. Succeeded in expanding the discussion from just fuel subsidy to the cost of governance and corruption. Succeeded in building momentum for the protests day after day. Allowed infiltration by political special interests into their midst. My Verdict: Verdict is not yet in. To be revealed in the next few days. There you have it. 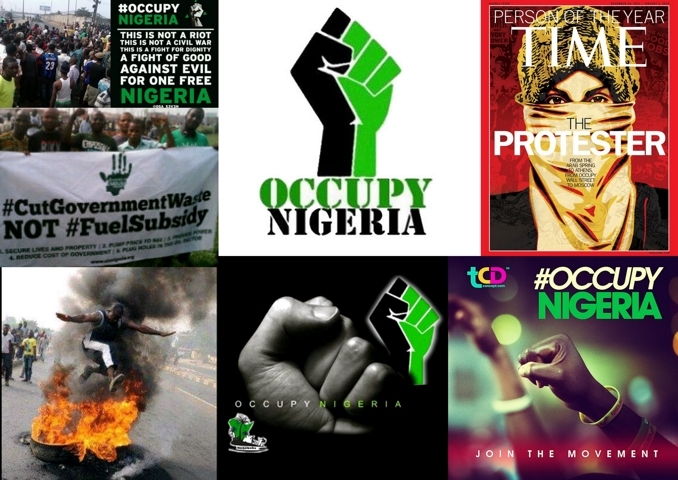 My Take on Occupy Nigeria fuel subsidy protests. What do you think? you could not have put it any better. i dont think GEJ is in charge of this country. i think the problem really arose when civil society groups outsourced their negotiating power to the NLC/TUC. historically the NLC has always been known to sell out so i am not too surprised. then GEJ has really shown that he does not have the brains to rule this country with his arrogant display of military force in lagos. those who make peaceful revolution impossible will make violent revolution inevitable …John F Kennedy. Are you wishing for NLC to ask the people to fight the Military? Deploying the military in my opinion betrayed the level of fear GEJ administration had about the potency of the largely peacful protests and the momentum that was being built. That was a strategic advantage that NLC threw away by calling of the stikes. I would not advocate them to ask people to fight the military. That would be madness and woulld have resulted in a massacre. They should have continued with their sit at home order. Given time, government would have caved in. Also most commmentaries now show the vast majority of people and groups (even some state branches of NLC) view the cave in as a sell-out. If that is true or not is not really the issue now. But the NLC/TUC leadership threw away a strategic advantage in my opinion and hence were Losers in this impasse. Thanks for dropping in your view. Appreciate it.